Please join the Foundation in THANKING our teachers. A perfect way to honor and thank your teacher as this school year comes to a close is with a gift to the Foundation. Your gift will support all students district wide! The Thank A Teacher Program is a great way to express your gratitude to the educators and other school personnel who make a difference in your child’s life each and every day. By honoring an educator with a tax deductible donation to the Foundation, you will not only communicate your appreciation for a job well done, your gift will help inspire learning and enrich education for more than 11,122 MCCSC students. Gifts can be made online by clicking the Donate button. 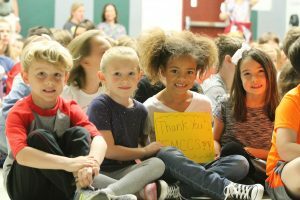 In the comments type TAT gift, the teacher you would like to thank and your personal message OR email the completed PDF to fmccs@mccsc.edu OR new this year is a Google Form Link to send your note. Classrooms can also take up a collection of small gifts to honor their teacher – please have a PTO parent coordinate for your classroom. Once again our friends at Curry Auto Center are joining us in thanking our teachers via Facebook and Twitter. Post or tweet a message using #FMCCSThanks @CurryAutoCenter on Facebook & Twitter and they will donate $2 per post from May 7-11. Our goal is 1,000 posts! To reach this goal we need your help. You can also help your teacher win a $100 INSTAGrant. All current MCCSC teachers thanked in this campaign will be entered in our drawing for five INSTAGrants. To enter your teacher in the drawing your post must include #MCCSCTeacher, teacher’s name, school, and #FMCCSThanks. Thank you for making a difference in the lives of our students.